Is an aesthetic upgrade enough to keep Acer's mainstream 15.6-inch laptop favorable in the eye of the customer? With a matte finish, the high-gloss devil has been banished from the outer lid and the interior has a noble touch. An i3-330M combined with an ATI HD5470 look after the performance end of things. Asus has refreshed their award-winning Aspire model with a new design. 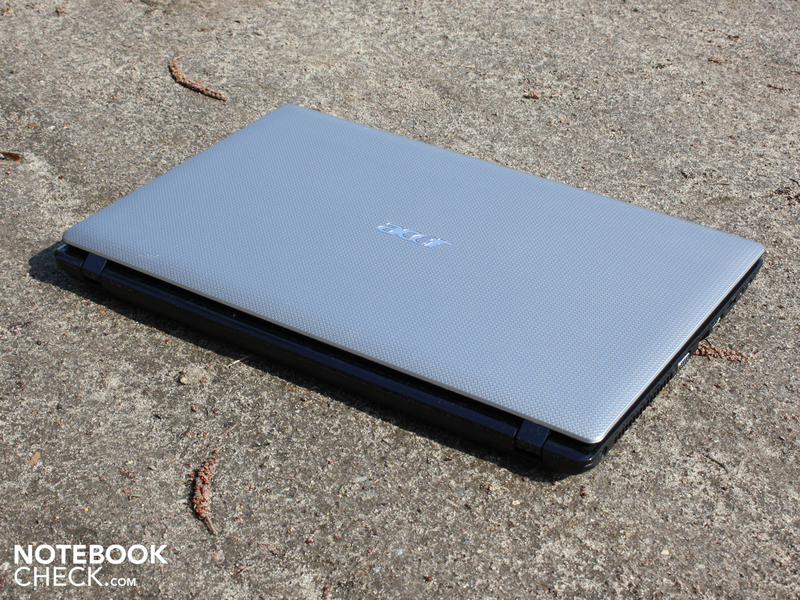 The face lift is clearly more elegant and altogether makes this 15.6 inch model thinner than its predecessor, the Aspire 5740G. Where earlier a simple, grained plastic adorned the palmrest has now been replaced by an insensitive glossy finish. Technically speaking, we brought home the favorably equipped 5741G-334G50Mn variant, featuring the weakest of the Arrandale i3 processors (Core i3-330M). Together with a dedicated entry-level GPU (ATI Radeon HD5470) it should provide all-around performance on the one hand and on the other retain its mobility. 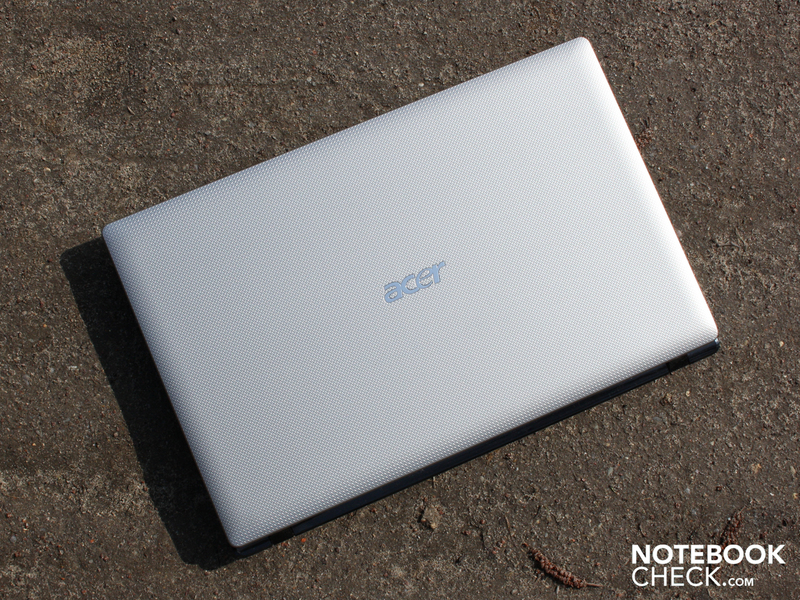 If Acer's 15.6-incher (630 Euro) is the right choice for mobile office users, our comprehensive test will prove it. The case of the Aspire 5741G is as well suited to mobile use as it is for the workplace, at home or in a dormitory. Hands are confronted with a comfortable surface around the work area; the hard brushed plastic looks like aluminum and feels metallic to the touch. Fingerprints or smears have no chance here. Unfortunately the reflective black display bezel doesn't fare as well. The case is stable and through clean lines leaves an impression of high quality, though with both hands we were able to twist the chassis slightly. 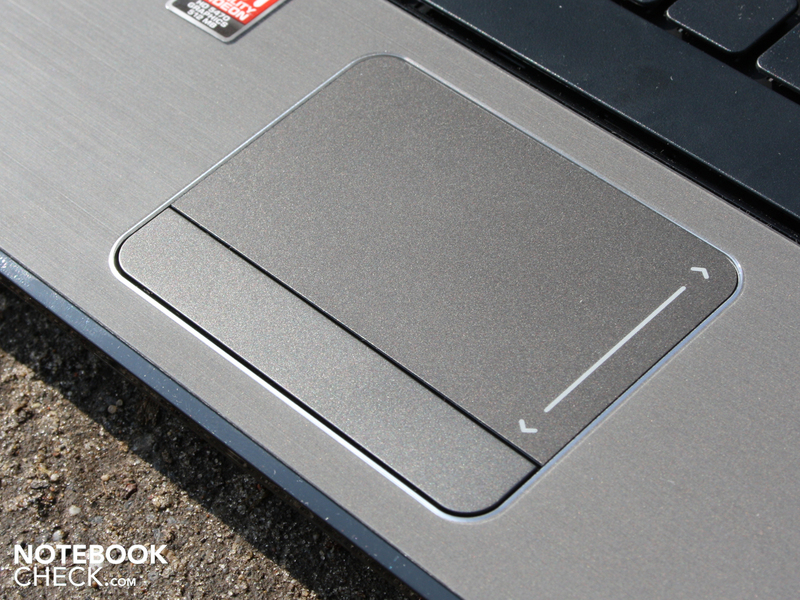 The palm rest area is steady in every position, as is the underlying area supporting the keyboard. We were able to bend the deck lid slightly, but due to the stiff surface and grip a comparatively high stability is achieved. The surface can only be slightly dented when applying pressure. The deck lid, with an anti-skid surface, is insensitive to scratches and marks. These features make the 15.6-incher suitable in our eyes when looking at mobility. A small area of weakness in the construction is in the support of the deck lid. 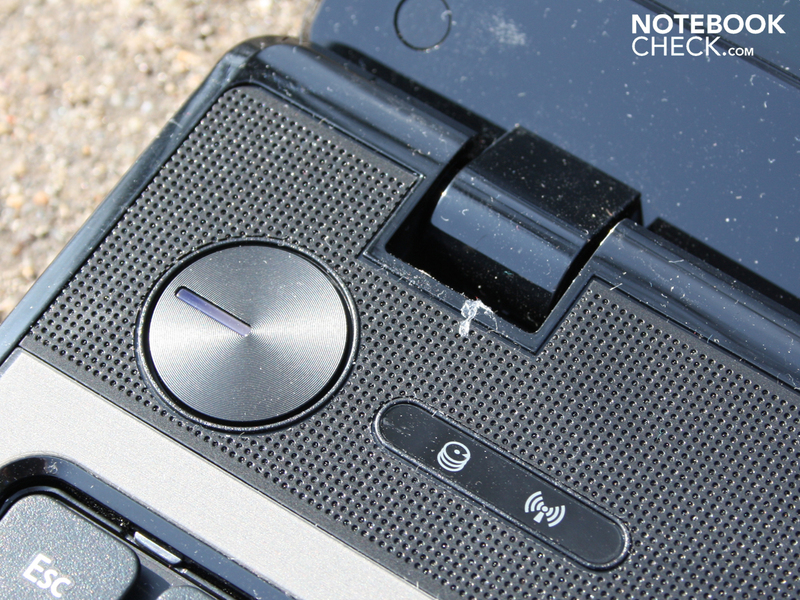 Every notebook has small rubber dots that line the edge of the TFT which support the display against the base-unit when in the closed position. 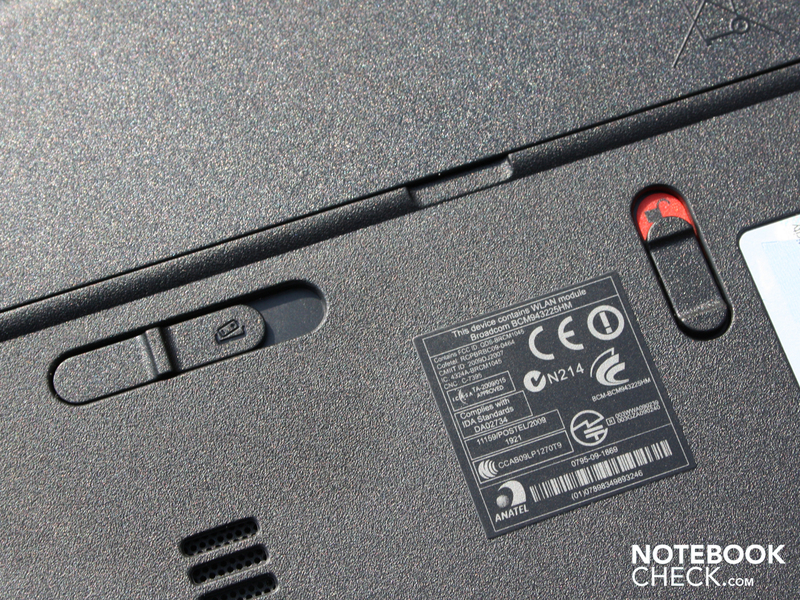 However the 5741G does not have these same supports, resting the display against the surface of the laptop, causing abrasions on our test model. Users should secure two one millimeter rubber stickers in this area. 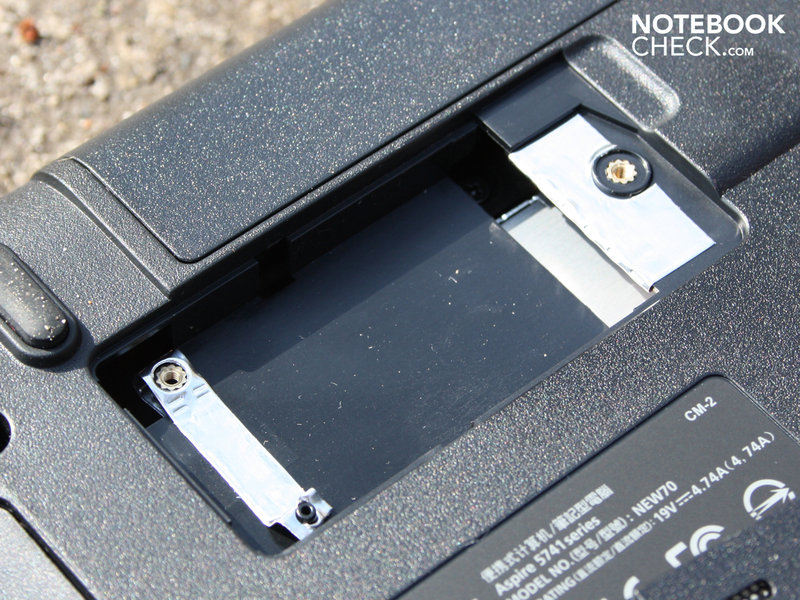 The battery can be removed for long-term use on a desk, with the battery removed there are no obvious holes near the work surface. The hinges keep the lid in a secure position without any flex. They are very taut, requiring us to use two hands to open the laptop. 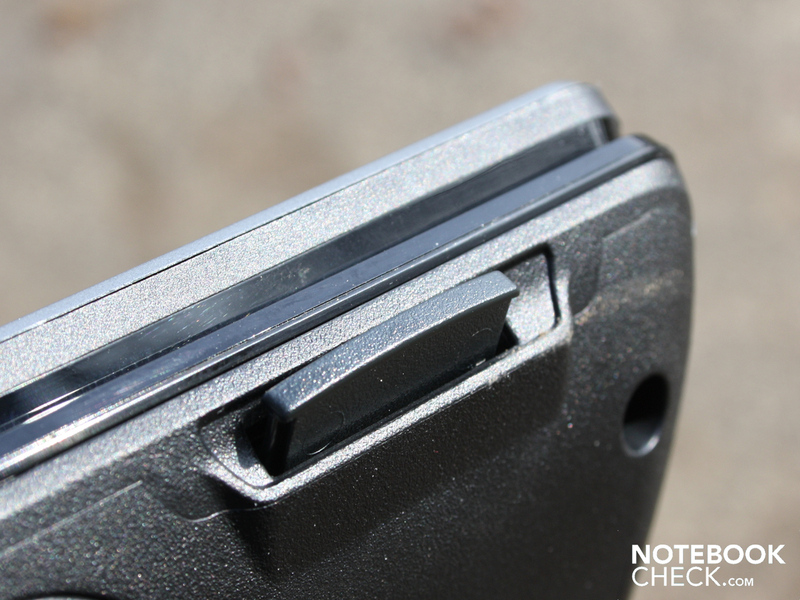 The hinges themselves sit very securely in their locking mechanisms. The maximum angle at which the display can be opened is more than sufficient, measuring 160 degrees. The base plate, made of simple plastic, is easily impressionable when using one finger. 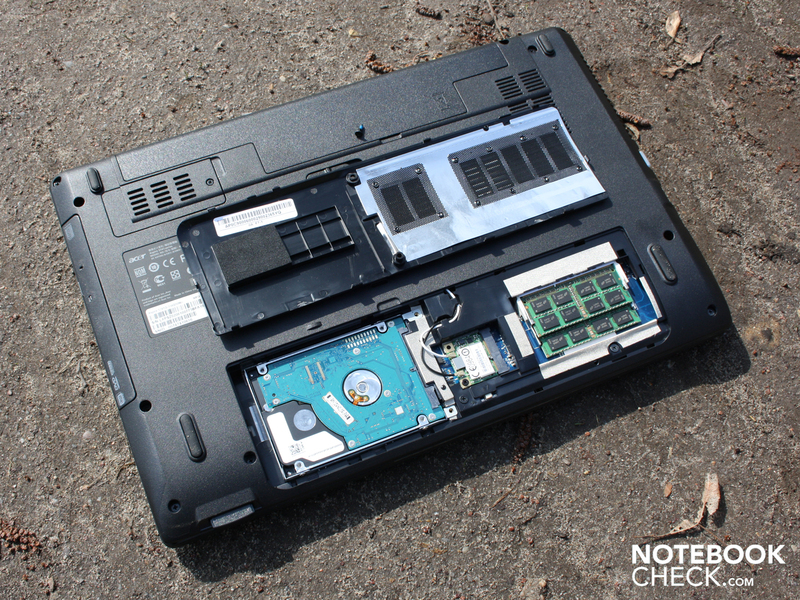 The large opening on the underside offers expansion possibilities: there is easy access to the hard drive, RAM and WLAN module. 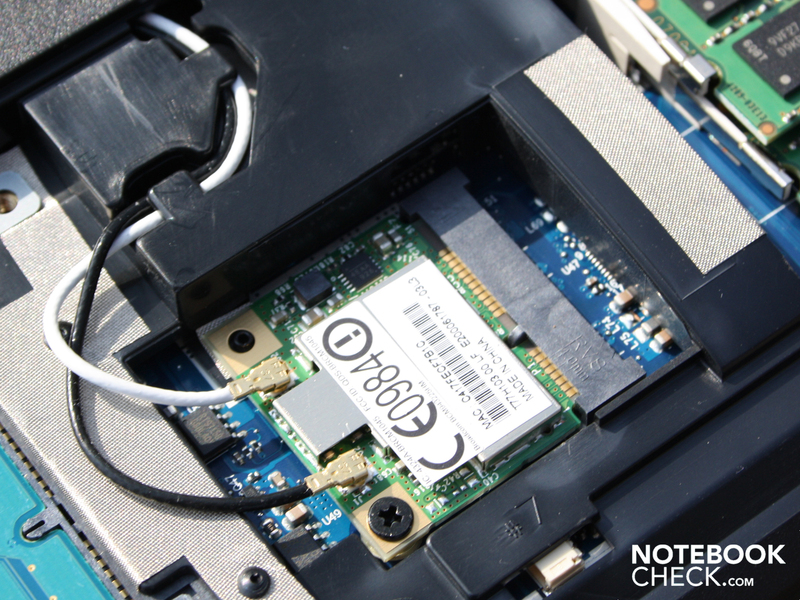 For the connection of a printer, router, mouse or hard drive, the Acer Aspire 5741G unfortunately has a limited amount of available connections. E-SATA, Display-Port or FireWire are among the missing here, though there is an HDMI connection on the left side of the case. External monitors or flat screen displays can be connected via an HDMI or analog VGA connection. USB connectors number three in total. The position of the right and left hand USB ports are not particularly sensible. While using a mouse, both right and left handers are at a disadvantage since other USB cables as well as HDMI/VGA connections impair the use of a mouse. Relocation of some of these connections to the rear sides or back of the case would have made connectivity painless. 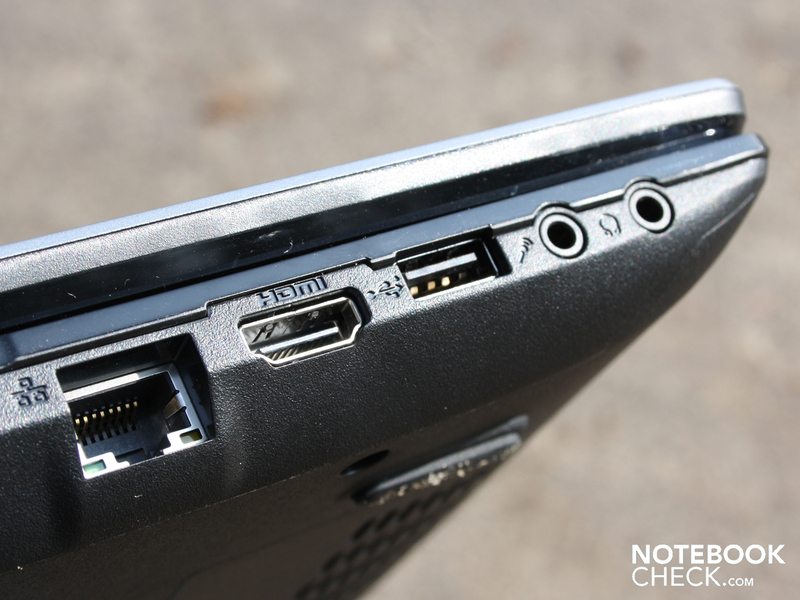 The deeply positioned hinges hinder the use of an AC adapter on the rear of the laptop. All sockets, including the power connector, are only accessible on the (viewable) sides. This, depending on the amount of necessary cables, can lead to an unsightly desk surface. 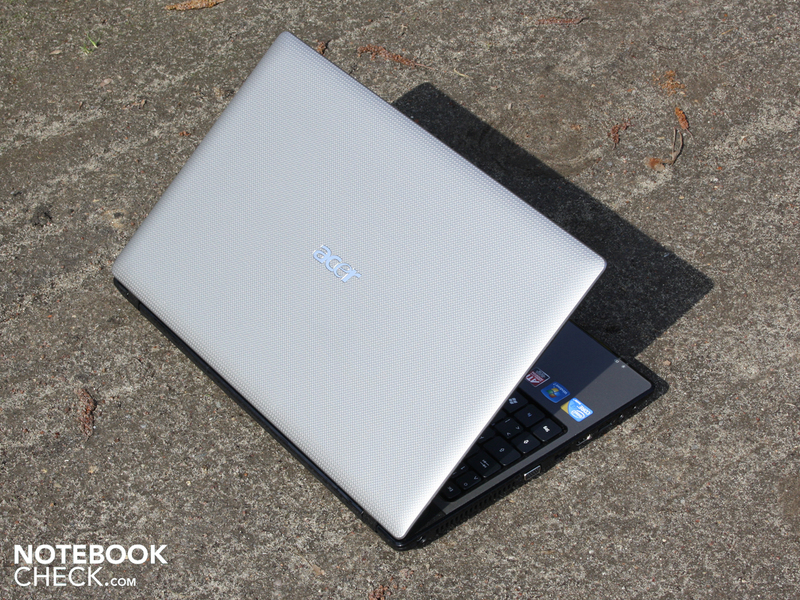 There are no available docking stations for the Aspire 5741G. The fastest WLAN Draft-n standard is supported by the Broadcom 802.11a/b/g/n wireless cards. You also receive an integrated Bluetooth module. Those looking to use the 15.6-incher at home in combination with a gigabit switch will appreciate the appropriate ethernet card, a Broadcom NetLink gigabit ethernet. The 5741G is on the cutting edge of network technologies. 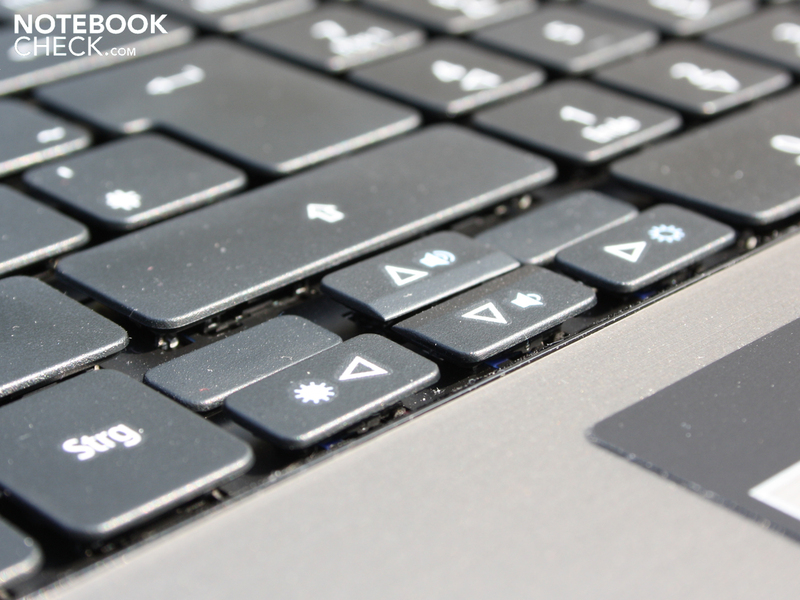 The keys offer the typist a comfortable and distinct pressure point and a large key travel. Depending on position the feedback is either spongy or acceptably firm. The keys, specifically those numbered one through nine, give in easily and provide a lightly sprung typing feedback in this area. The large input area is however sturdy. 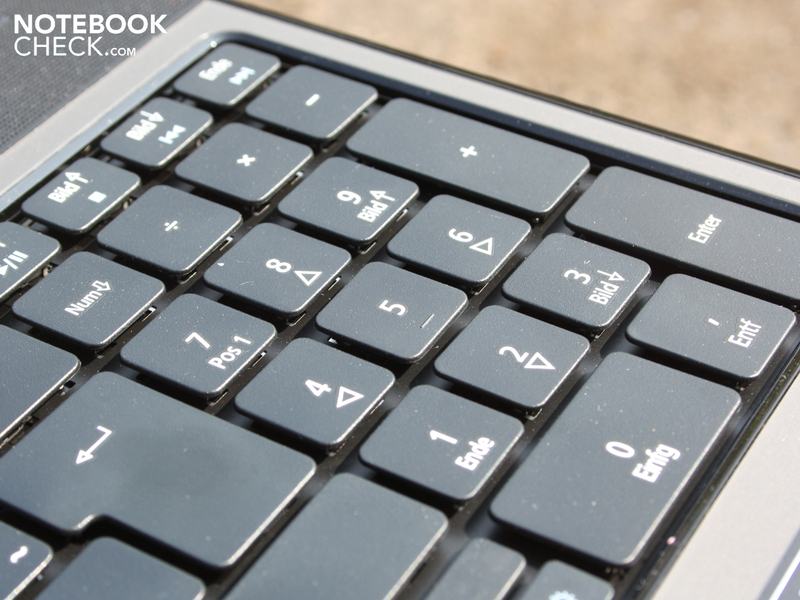 Acer integrated a numeric keypad, which lends credibility to its image as an office notebook. The keypad makes the input of numbers easier. 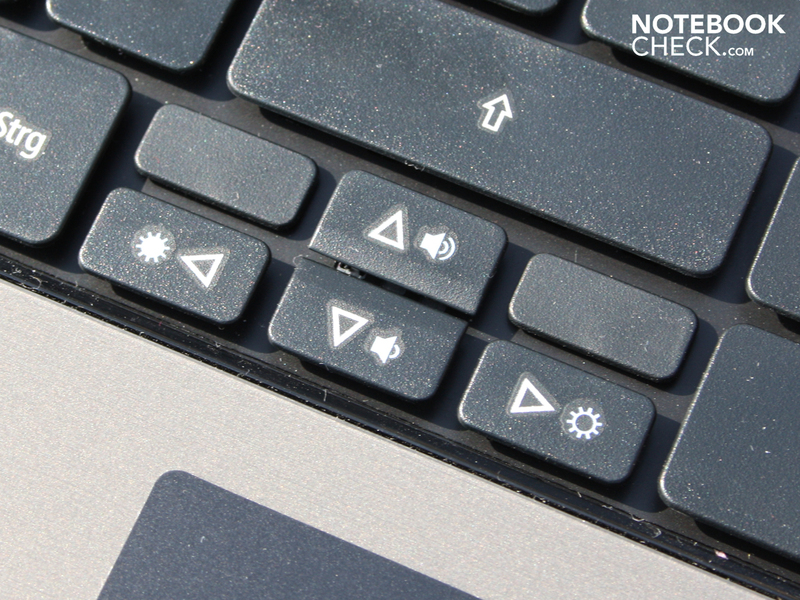 Also made easier is the use of the directional arrows, half as large as normal keys and set off by a small space by the shift key. Taking over for mouse functions is a Synaptics Multitouch Pad (V7.2). Its surface is a bit smoother than the palm rest and it tracks comfortably and smoothly. The touch-surface does not have a horizontal scrollbar, though it has an optically marked vertical scrolling area. 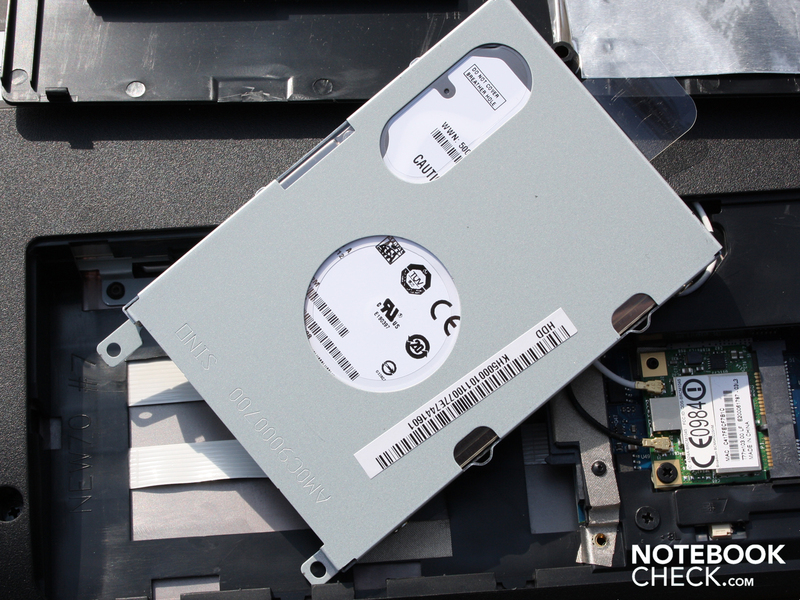 The missing touch area is not able to be reactivated from within the Synaptics software, as is the norm with notebooks. 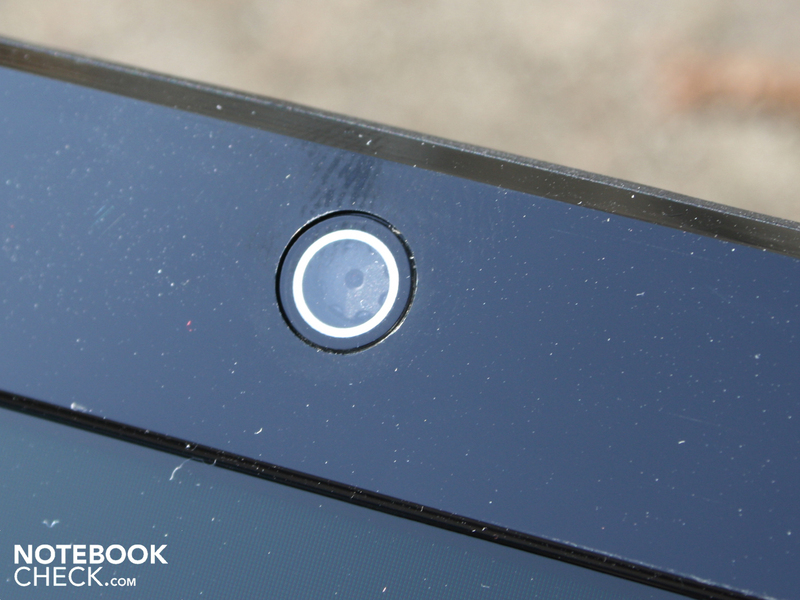 Thanks to the touch recognition, this missing feature is not horribly missed. Users can scroll vertically and horizontally with two fingers and classical gestures such as moving two fingers apart zooms in and out. The buttons click quietly, though they have a relatively high pressure point. They make an impression of quality, as they click with a solid sound. 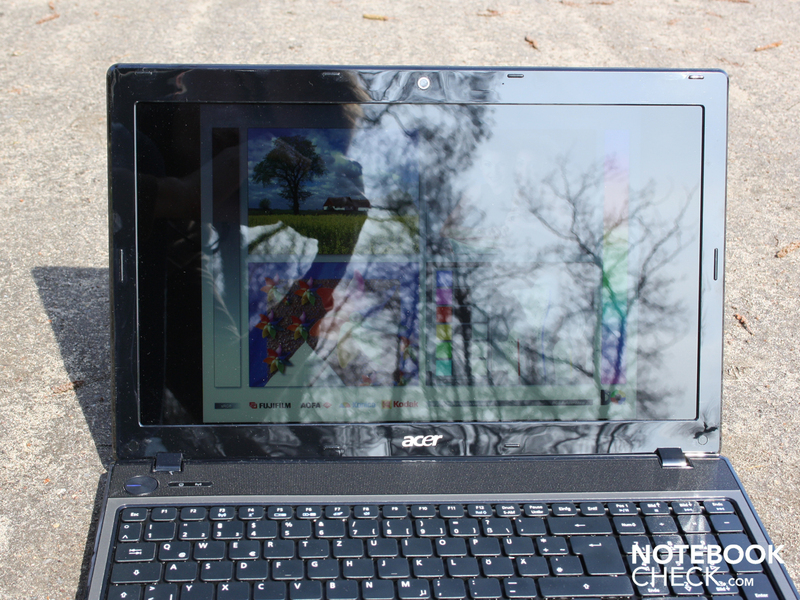 Acer had set high standards for the haptics of the 15.6 inch model, though this same approach wasn't done for the display. The reflective LG-Philips-Panel (type LP156WH2-TLE1) has a resolution of 1366x768. This WXGA-resolution is acceptable for a 15.6 inch display, and comes very close to the native 16:9 aspect ratio. Theoretically wide displays are well suited to displaying two program windows next to each other, though in practice this is hardly true because of the low resolution. Users have to scale the images, which in all web-browsers and Office is possible. The LG-Philips panel shows its Achilles heel when it comes to the low contrast of 172:1. 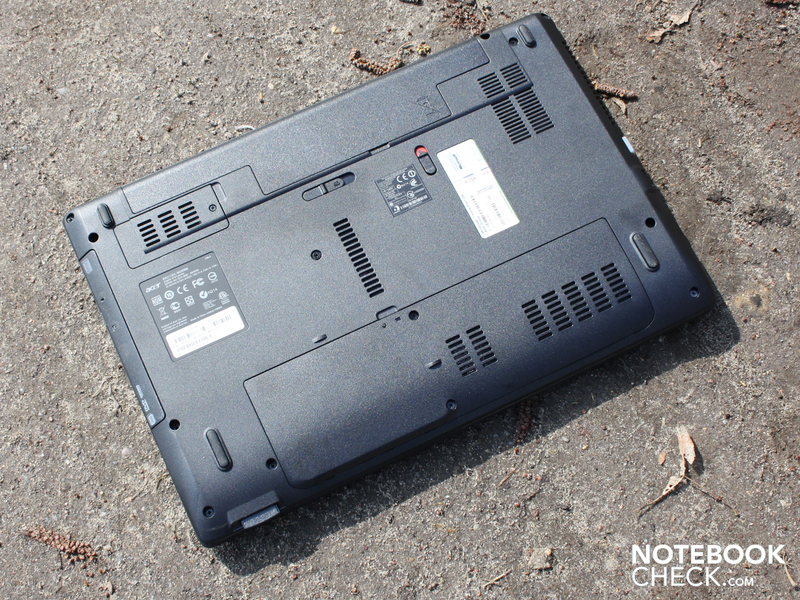 Such a low value is typical for office notebooks and netbooks. The glare-type panel improves the low contrast optically speaking, but this is a trick to deceive the eyes. For use as an office notebook or an all-rounder, the display is adequate, though an office-user will wish for a matte display due to the reflective nature of the panel. While looking at photos, films or computer games the colors are usually halfway appropriate, though for professionals editing images the display is extremely unsuitable. 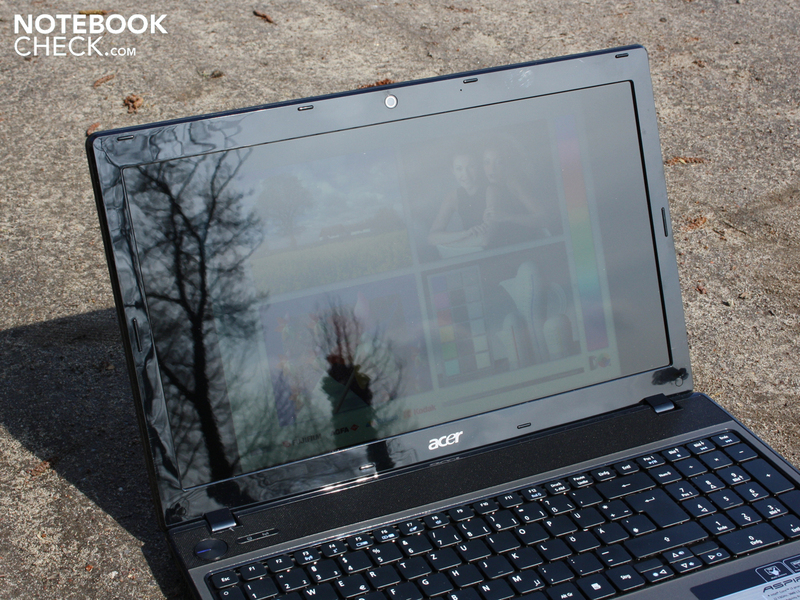 The small color space is clearly a defining feature of such a consumer notebook. The brightness measurements of the display panel resulted in good numbers. On average the luminance was 233 cd/m². The illumination of 92 percent was very consistent throughout. In interior rooms, users rarely need a luminance of higher than 180 cd/m². Users also typically turn down the brightness, otherwise the picture has a bit too much glare. With the laptop in the summer. 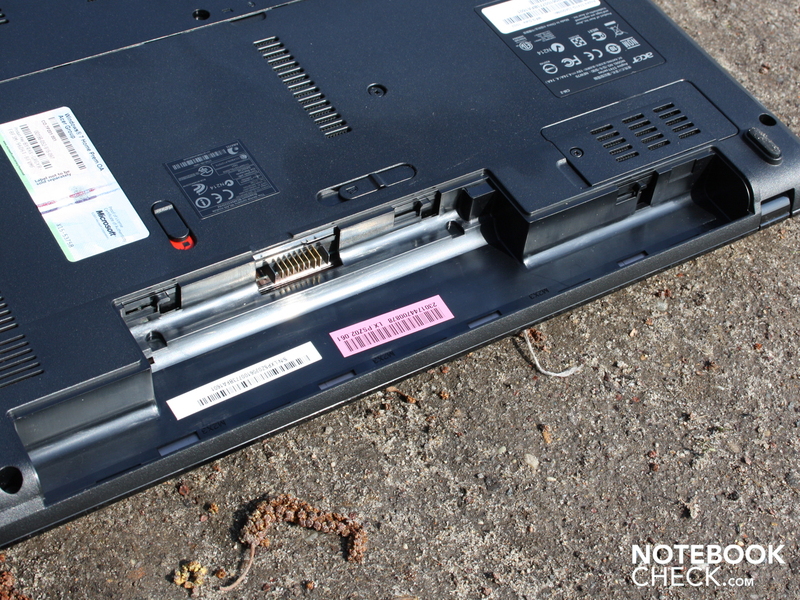 Users looking to take their Aspire 5741G traveling and use under daylight or glaring sunlight are going to run into problems. The 15.6 inch panel lacks a matte finish to avoid reflections. For office notebooks, the matte finish is the classic panel-type. The high luminance of 233 cd/m² works well against reflections, however. Under direct sunlight we had difficulties finding a viewing angle that was not disrupted by reflections. Use in a park or in a cafe is certainly possible, depending on location and how the light moves around. We are able to see horizontally up to a 40 degree deviation from the central viewing position, upon which the display darkens and the colors falsify. Vertically, this happens as soon as a 15 degree deviation is seen. The picture then substantially darkens and the colors invert. In a darkroom the small vertical viewing angle of the Aspire 5741G is easily identifiable, though strong limitations are occasionally viewable from above or below. When multiple people want to watch a film or look at photos, it is likely that some will have difficulties seeing a clear picture. The Intel Core i3-330M (2.13 Ghz 3MB L2 cache) is the weakest Arrandale-processor from Intel. The sister model i3-350M is, at 2.26 GHz, clocked slightly higher. The i3-330M, like the i5-520M, features a graphics unit integrated into the processor., though it is deactivated here in place of a dedicated ATI Mobility Radeon HD5470 (512 MB GDDR3). 4,096 MB DDR3 SDRAM (2 modules) is also available here. One of the most important properties of the i3-330M is Hyper Threading (HT). The concept behind HT is that every physical core also has a virtual core operating along side it. The dual-core processors can, therefore, benefit from computing with a total of four threads. The difference between the i3-330 and the i5/i7: the i3 does not have Turbo Boost. This function allows each core, depending on system and application requirements, to have its frequency dynamically changed. Single-core applications take advantage of the same performance as multi-threaded ones. For professional users and gamers Turbo Boost is a huge advantage, as every type of application uses the increased speed. 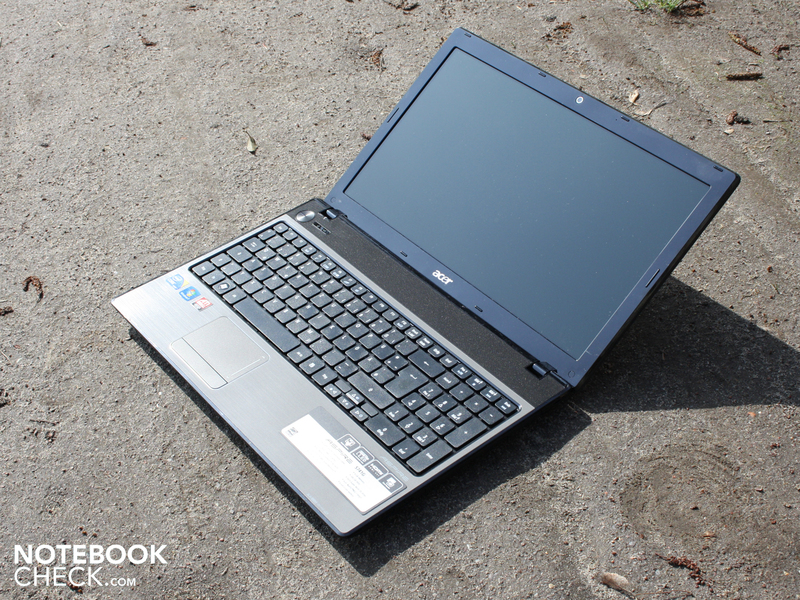 Users of the Aspire 5741G cannot, however, benefit from this. A PCMark Vantage test achieved an overall system core of 4,956. This value measures the application speed of a notebook, where all components from the CPU to the GPU to the RAM are included. With this score, the 15.6-incher lies at the same level as the Toshiba Satellite L550-207 (4,956 points) with an identical i3-processor. 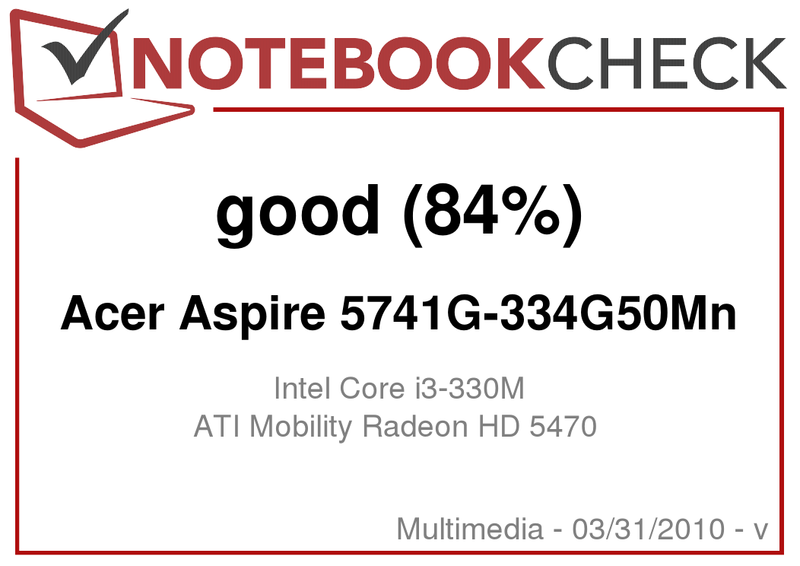 Even laptops with a stronger dedicated GPU do not necessarily have a better system performance: for example, an Acer Aspire 8942G-334G64MN (ATI 5650) scored an overall 4,755 points despite posessing a stronger card. A look at the infamous Core i5 processor, the 520M, often built in to performance-oriented machines shows some drastic contrasts. A Dell Studio 1558 achieved 5,929 points despite not having a dedicated graphics processor. A Samsung R580-JS03DE even managed 6,026. The reason for these differences are the Turbo Boost feature of the i5/i7 processors as well as the generally higher frequencies (2.5 GHz). At the ready stands a 5,400 RPM Seagate hard drive (ST9500325AS) with a 500 GB capacity. Sequential reads from the rotating platters were measured at 63.9 MByte/s, lending the Aspire 5741G good system performance, though the numbers here were average. 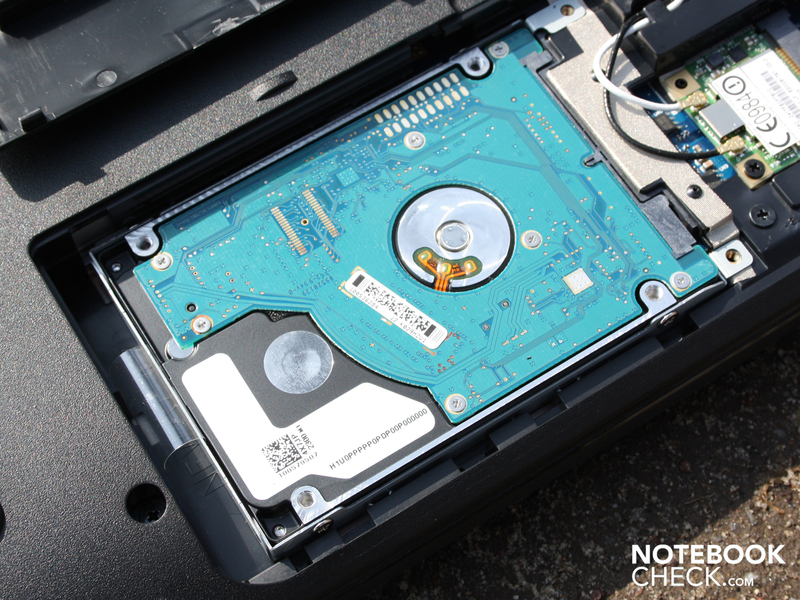 The HDD is audible during operation thanks to relatively loud read and write heads. Bad Company 2 knows no mercy and clearly points out the weaknesses in the HD5470, despite having GDDR3 memory. A miserly 20 FPS was achievable at medium settings (1366x768, medium, HBAO off, 1xAA, 1xAF). Turning the dial back on the detail and the resolution down to 1024x768 (Minimum, HBAO off, 1xAA, 1xAF) brought an small increase of 27 FPS to the table. 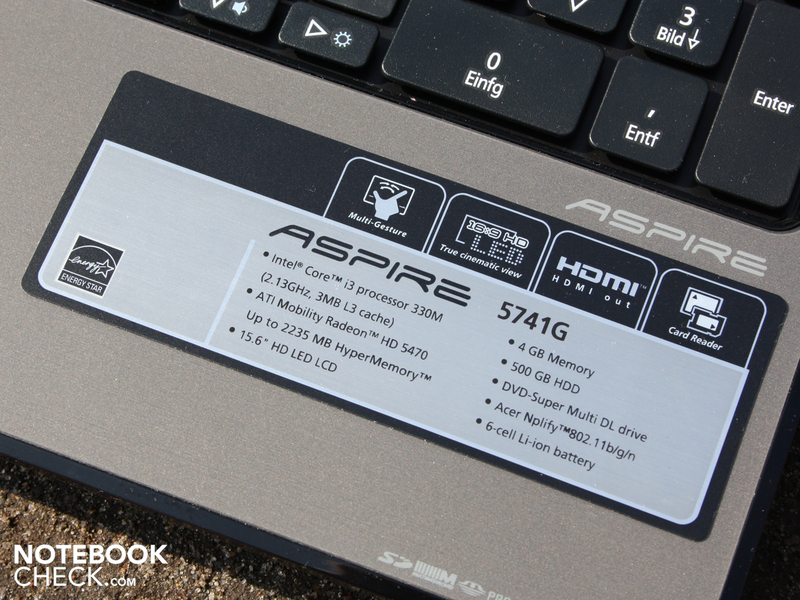 To truly play the game fluently with the Aspire 5741G, an even greater decrease in resolution is necessary. In comparison, a Toshiba Satellite L550 with an HD5165 (upper mid-range) achieved 44FPS on medium settings (1280x800, medium, HBAO off, 1xAA, 1x AF). Infinity Ward's shooter, Modern Warfare 2 requires less computational power. With low details and resolution set to 800x600 (0xAA) a fluid 77 FPS is possible. Unfortunately at this detail the game no longer looks very good from an aesthetic standpoint, so we pumped the settings up halfway (1024x768, 2xAA, details medium). Here the frame rate takes a drastic nosedive to 25 FPS. The game gets jerky in sequences with heavy action. Those who select a mix of low and mid-level details without AA will experience a halfway playable game at around 30 FPS. 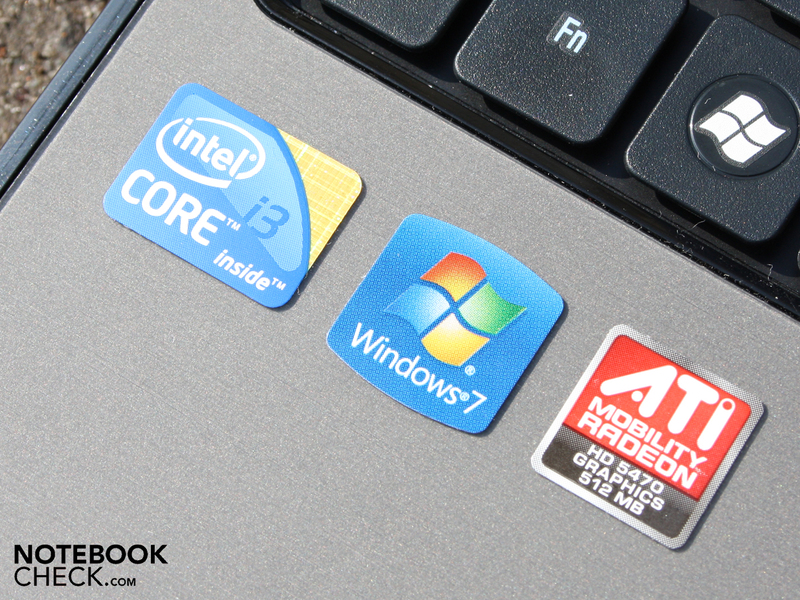 Both games show that with the ATI HD5470, there is not a whole lot of power on tap. Current games as well as more demanding titles should not be on your must-play list if your looking at this offering, however older titles such as Left4Dead are sufficiently playable in higher settings. Regarding noise, Acers 15.6-incher put up good numbers. When surfing, listening to music or typing on Word the system fan runs at low RPMs but never shuts off entirely. We measured 31.7 dB(A) in operation though not under constant stress. The sound pressure remained constant, which is to say that the RPM speed of the fan never fluctuated. The hard drive in these instances is clearly audible at 34.1 dB(A). In our two test games, the cooling system spun up to 36.7dB(A), where we could unfortunately hear two different fan speeds (35.1 and 36.7 db(A)). During the first two-hour Furmark and Prime95 stresstest the fan returned a maximum 37.8 dB(A). During an instance such as this, the cooling fan spins constantly. All told, the fan-control settings made a good impression on us. When necessary the fan spins up and works to cool the system back down, when unnecessary the fan turns quietly in the background. The temperatures remained low, reaching 38 degrees Celsius only briefly when under simultaneous CPU and GPU stress. During a normal scenario editing text and web-surfing the average temperature on the underside measured 29.5 degrees Celsius. The palm rest, at 30 Celsius, remained within acceptable limits. The measurements under heavy load (stress test) resulted in a peak of 38 Celsius on the top side of the notebook. This resulted in warm fingers, as we took the temperature readings from the center of the keyboard. 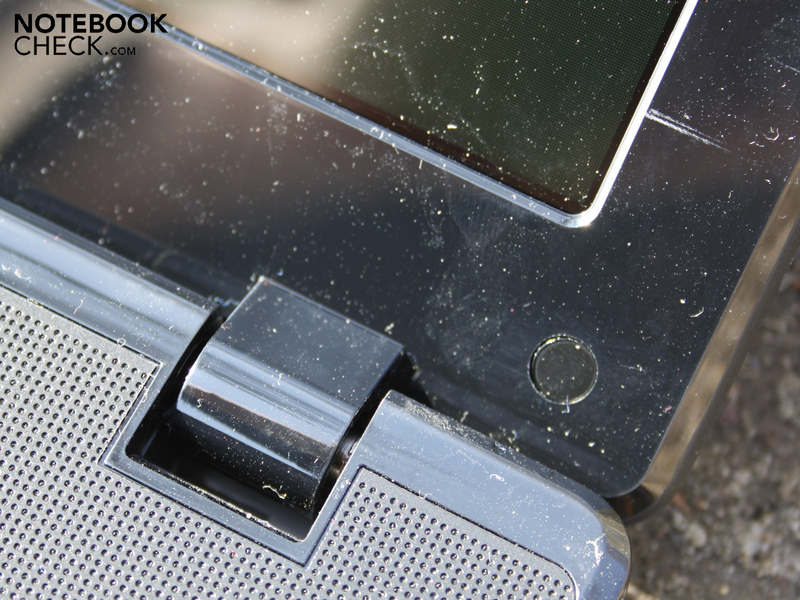 The underside of the notebook around the exhaust vent reached 38.6 degrees Celsius. We once again saw the phenomenon where certain areas of the notebook when under stress do not become any warmer than they were when at idle. Specifically the bottom of the notebook, aside from the proximity to the heat pipe, was unchanged during stress testing. Exhaust heat takes a while to warm the case when the fan RPM is kept to a minimum, though this cannot be said for when at high RPMs. The components clearly generate more waste heat under stress, though in total the case is well ventilated and the air is exchanged quickly. The Aspire 5741G survived the 2 hour stress test without any thermal throttling or crashing, nor did the CPU become warmer than 74 degrees Celsius. It is little wonder then that a 3DMark06 test that was started right afterwards yielded the same results as the first test: 3,669 3DMarks (CPU 2,239). The stereo loudspeakers are located above the keyboard under the mesh grid that is typical of the Aspire line. Expectations of sound performance on par with a multimedia-notebook were not met by the 5741G, but for an office laptop the sound was sufficient. The tone is heavy in the middle, but leaves out the high and low frequencies. All told, the sound image is rather woolish, which unfortunately cannot be improved even by changing the setting within the system menu. The volume is decent, but not particularly high. We recommend connecting external speakers through the 3.5mm audio-out: we tested this with two Yamaha speakers (YST-M20SDP). 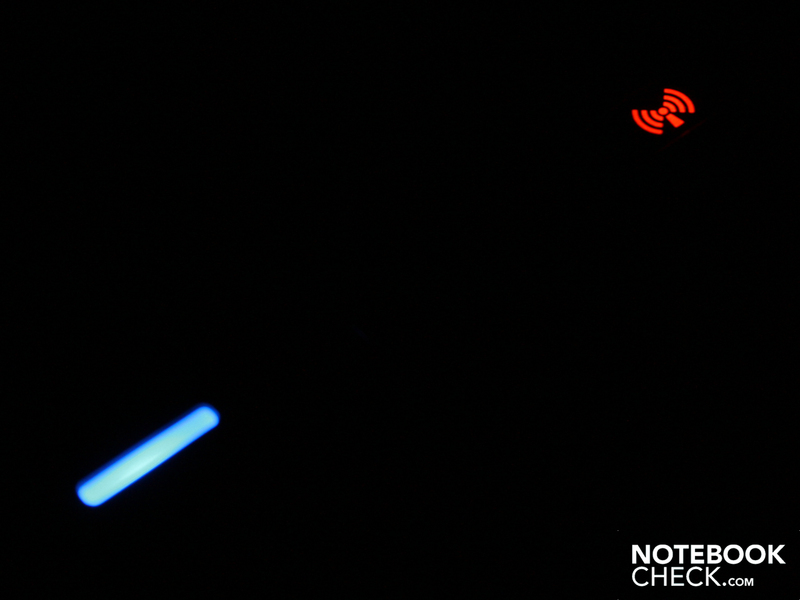 The signal from the notebook was very clean and contained very little overall noise, which translated to great performance from the external speakers. 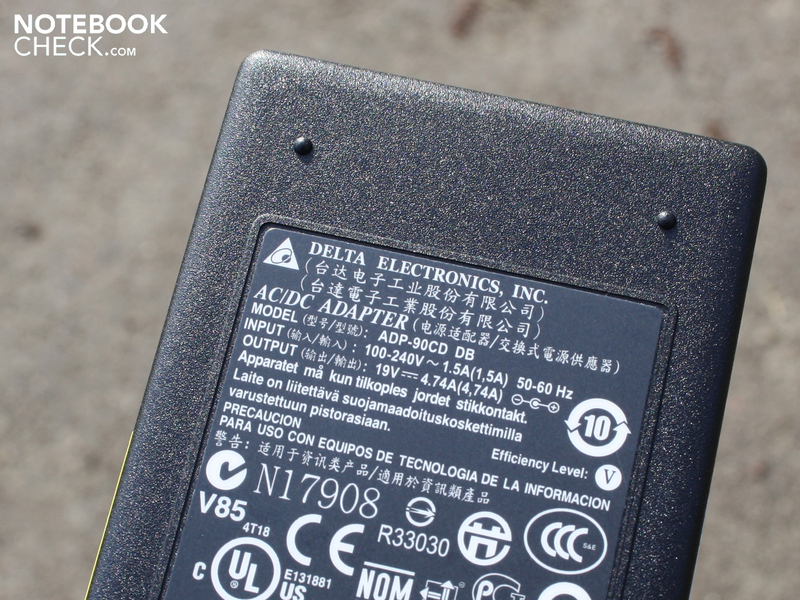 Netbooks and later CULV-Processors have raised the bar and the expectations for battery life in notebooks. 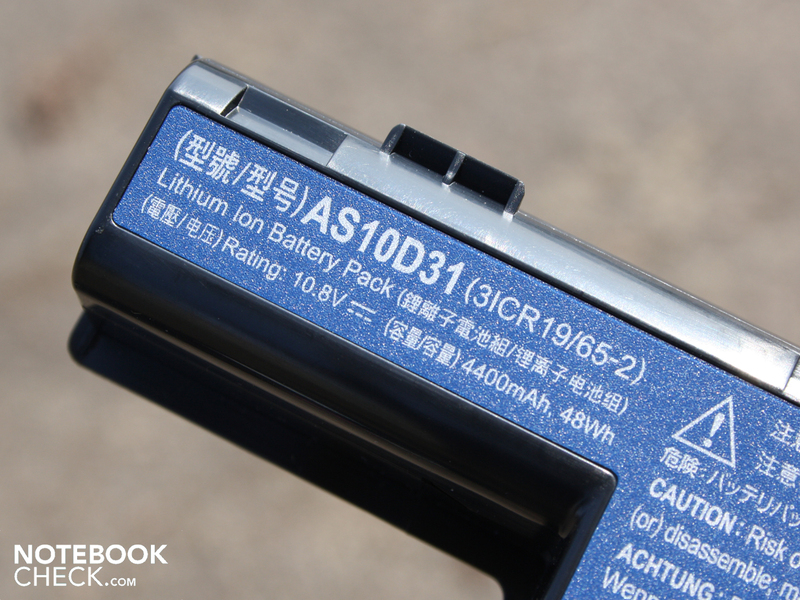 With its two hours of capacity, the Aspire 5741G won't be able to have its cake and eat it too; the high 35 Watt TDP of the Core i3-330M is the Achilles heel when it comes to battery life. Battery life while surfing the internet with WLAN activated amounted to 2:19 Hours (139 minutes). In this time we completed a Steam download and visited various news portals. Users doing the lightest amount of work would be able to raise the battery life to 3:42 hours, but these 222 minutes of battery life as measured with the BatteryEater reader-test are completely useless when it comes to daily tasking. This measurement was taken at idle with lowest display brightness and with WIFI module turned off. Testing battery life while watching a DVD Film showed 144 minutes (2:44 hours) of life. For the next film viewing, the 4,400 mAh battery needed 1:31 of charging before it was at the ready. 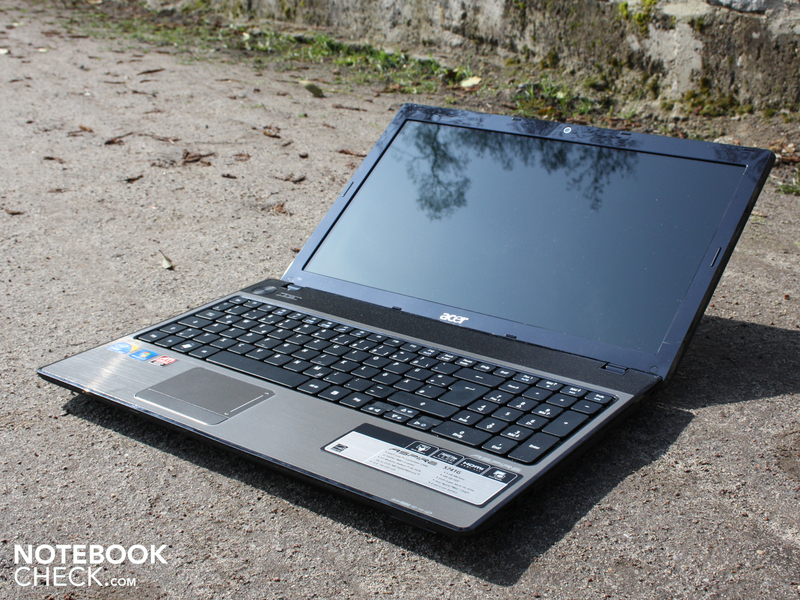 In its prevailing form as an office-notebook, the Acer Aspire 5741G should be very efficient when it comes to energy use. Interestingly, this is also the case. As long as all options for saving energy are ticked off and the luminance of the display is set to its lowest level, the idle energy use lies at 10.5 Watts. 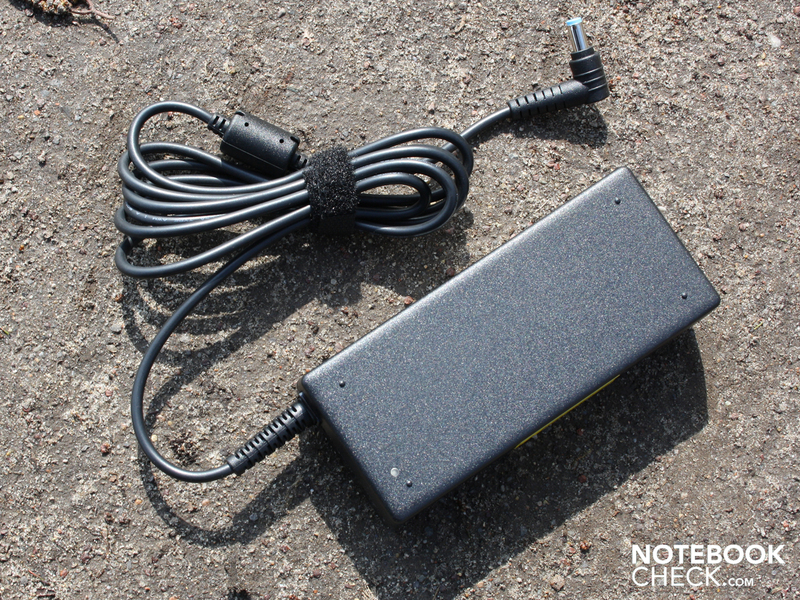 Realistically, the average is around 21.4 watts, the most that the 15.6-incher uses when at idle. 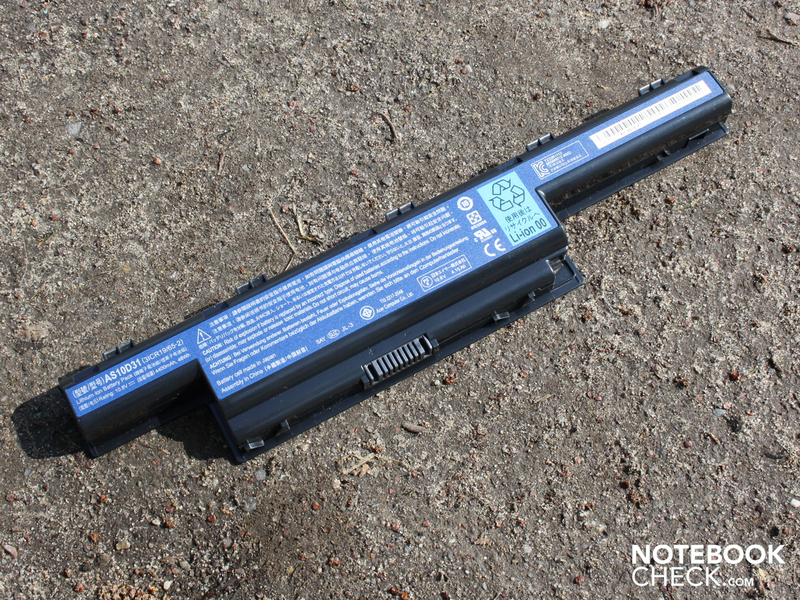 This low level of energy consumption has previously only been achieved by one Arrandale notebook, the Toshiba Satellite Pro S500-115 (9.5 Watts). This model, however, does not feature a dedicated graphics card. Those wishing to conserve more energy have to look to CULV-notebooks. Here the Asus UL30-QX050V merits a recommendation, as it uses only 8.8 watts at idle. When the HD5470 is active during a 3DMark2006 benchmark, this figure increases to 45.1 watts. The maximum consumption, as measured under Prime95 and Furmark stress tests was 58 Watts; the 90 Watt AC adapter therefore provides sufficient capacity. 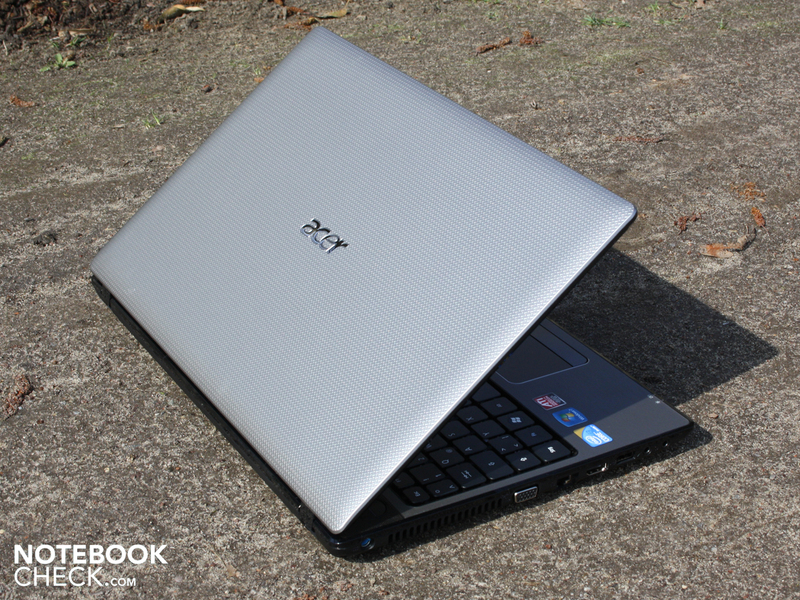 The Acer Aspire 5741G-334G50MN with the Core i3-330M (2.13 GHz) is an office all-rounder with comparably high power. The Core i3-330M is, generally speaking, better than its Core 2 Duo predecessor with a similar or higher clock speed. Particularly multi-core applications profit here. The entry-level GPU ATI Mobility Radeon HD5470 can play current 3D games only in reduced details and resolution. For those that wish to really experience the game, the HD5650, HD5165 or Nvidia GT330M would provide what you are looking for. The battery life of the 15.6-incher remains under that which was expected. Two hours surfing via WLAN or while watching a DVD are almost simply not worth mentioning in today's age of CULV-Notebooks. Add to this a reflective display which makes working in sunlight difficult. 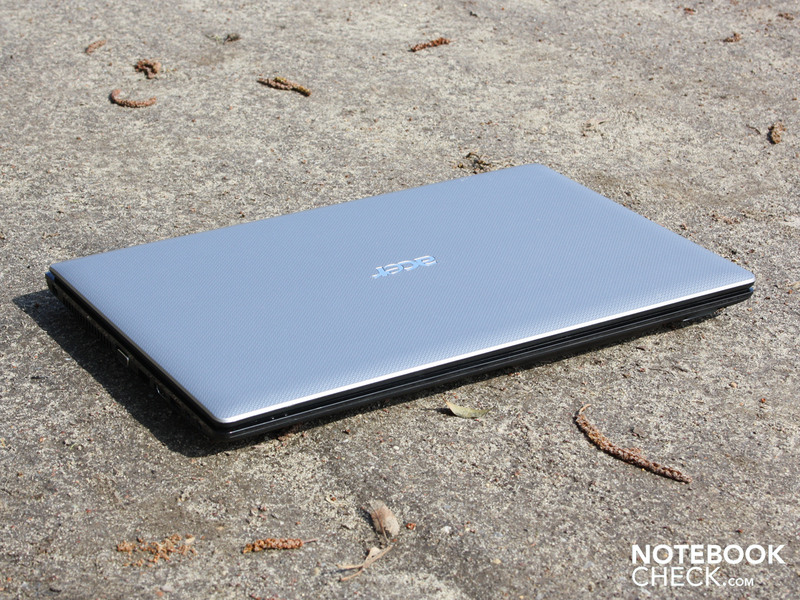 The Aspire 5741G has, to its advantage, a sufficiently stable casing, comfortable and insensitive surface and a bright display. The ergonomics are good and input is excellent, apart from the weak spring action of the keys, which for heavy typists isn't ideal. Those not looking for high performance and games or a large degree of mobility would be well served with the Aspire 5741G, currently available from 630 Euro. Are the days of high-gloss paint numbered? and pay attention to the proximity of the wall outlet. The battery has 4.400 mAh on tap. Which is enough for two hours of mobility. have to unlock the mechanism first. The base plate has two openings. and the 2.5-inch hard drive (Seagate ST9500325AS). With a capacity of 500 GB, future upgrades of the hard drive won't be necessary. Those wanting to use the light 2.5 kg laptop on the terrace will have to deal with many reflections. and the obligatory CardReader (Front side). 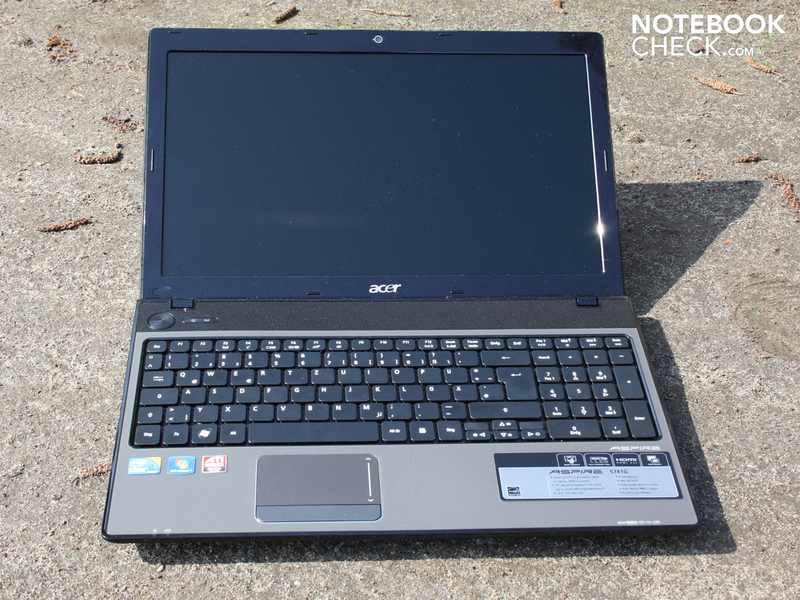 The Acer Aspire 5741G-334G50MN has a matte, patterned surface finish. It lies well in the hand and resists fingerprints and scratches. The interior, however, has high-gloss paint. The bezel of the TFT and the trim strip around the work area shine. 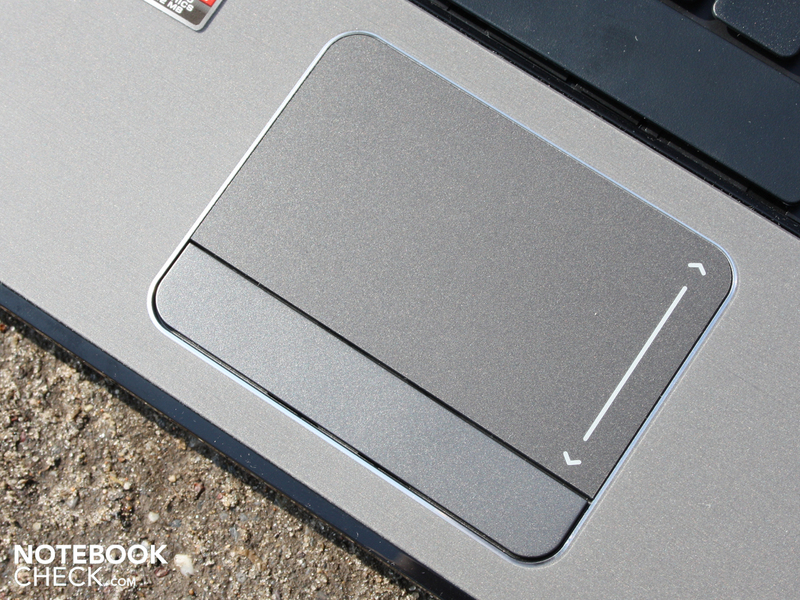 Palm rest (polished aluminium), touchpad and keys are a nice matte finish. 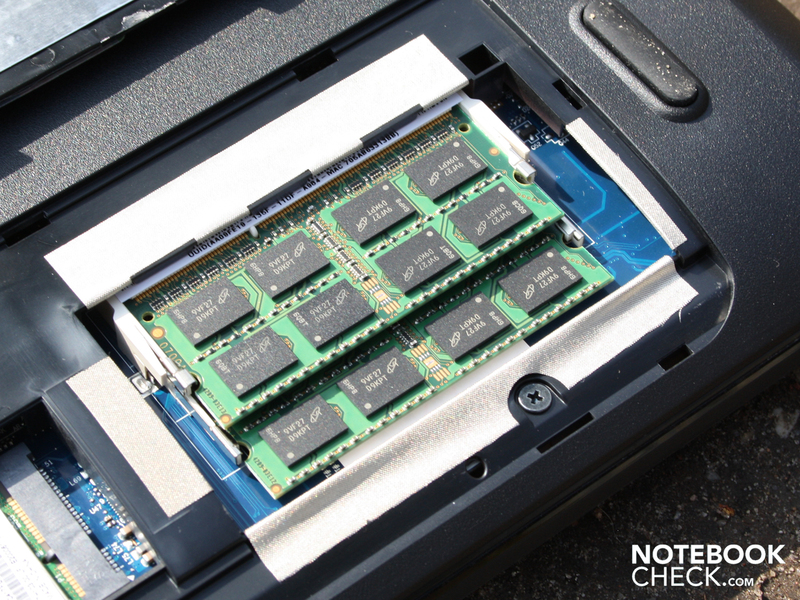 The configuration with Intel's weakest Arrandale processor leaves us expecting more from an office notebook. But first to the looks. 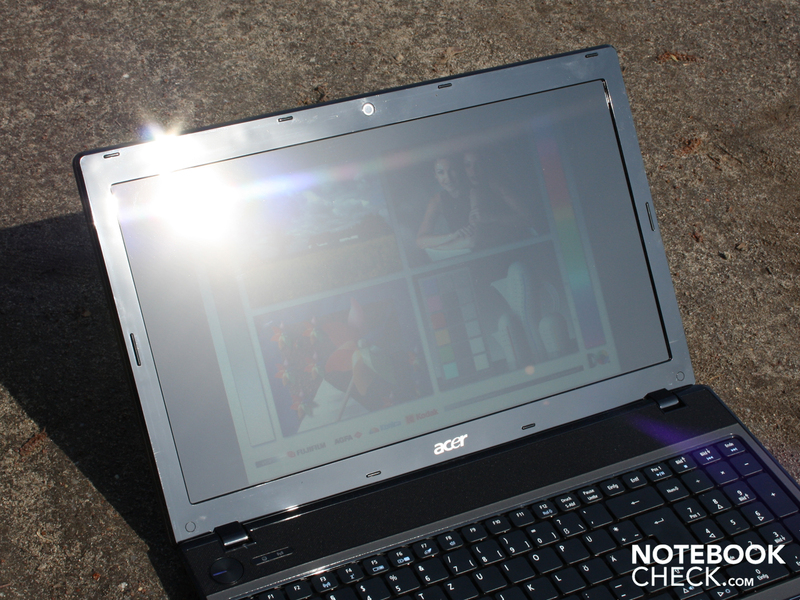 LED lighting effects are noticeably nicer than in previous Acer laptops. The webcam in the display frame can film the user. The mysterious second bay is empty, perhaps available space for a UMTS-module, though there is no socket. Finally a pleasant and insensitive interior surface. Has the manufacturer had a change of heart? 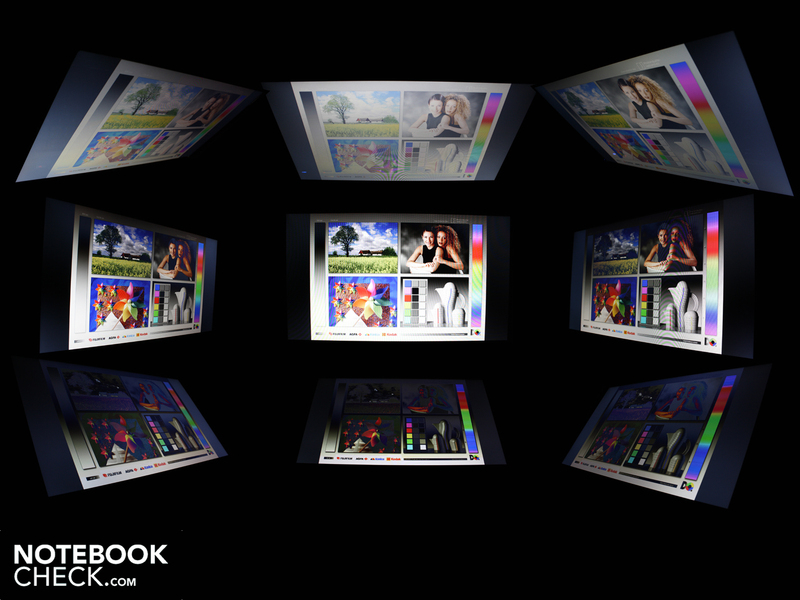 The 5714G isn't a a dyed-in-the wool multimedia device. A matte display would have given the 15.6-incher more credibility as an office laptop. The plastic on the palm-rest feels exactly like brushed aluminum to the touch. The sensitivity is however perfect. Toshiba Satellite L550-207: for a measly 60 Euro more this 17.3 inch model packs measurably better graphics power. 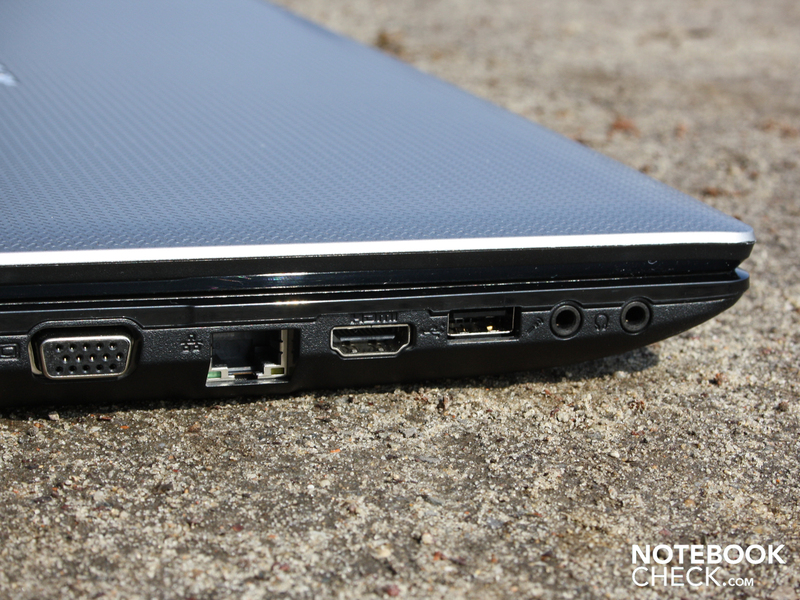 Packard Bell Easynote TJ75: the same also goes here, where more GPU power in a 15.6 inch format can be had for a few more bucks. 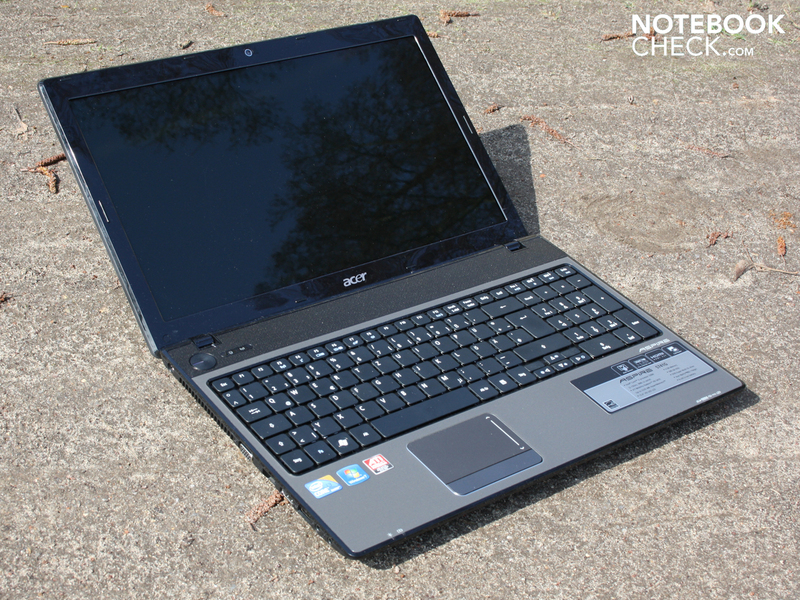 Acer Aspire 5740G: the predecessor to our test machine with almost identical technical data but a different look Asus K52JR-SX059V: packs the same technical prowess with a similarly contrast-weak display.